Download Catalog #74 PDF: Click to download (requires Adobe Acrobat Reader). Printable in B&W or color! 1905 A.A. Waterman#3 Twist-fill Cone Cap in Gold-filled “Filigree” overlay on BHR. The filigree is reminiscent of the “Parker 16” and may also have been done by Heath of New York. Indicia engraved in script, “AW.” Fine, triple-flexible nib. A ding or two in the cap derby and some upper cap edge brassing, otherwise near mint in original box. Close-up of pen in box. 1930 Montblanc L-30 Meisterstuck Push-Knob-fill Set in Black and Pearl. One of the rarest of the Montblanc Celluloids, in a top-of-the-line model. Extremely rare! GFT. Broad, oblique, italic nib (shaped like left foot). Near mint. 1930 Montblanc Twist-activated pencil for above set. 1935 Montblanc 322 button-fill in Lapis. Outstandingly rare and beautiful! GFT. Medium/broad nib. The cap is a shade brighter than the barrel (the color is better than 99% found), otherwise near mint. 1950 Montblanc 144 Meisterstuck PIF in Light Green Straight Striped. Multi-times rarer than the green striped! GFT. Broad, oblique, italic nib (shaped like left foot). Near mint. 1914 Montblanc 2F Rouge et Noir Safety eyedropper-fill in Black Hard Rubber with Red Star on cap-top. Replacement, but correct vintage “Warranted 14 ct 2” nib (medium, extra-flexible). Cap and barrel imprints are deep and crisp. Near mint+ with no signs of ink or use. Unrestored. 1950 Montblanc 146 Masterpiece PIF in Green Striped. GFT. Perfect color! Two-toned, medium, flexible nib. Slight wear to the nib plating, otherwise near mint+. See matching pencil below. 1908 Parker 38 “Snake” eyedropper-fill in Gold-filled on BHR. 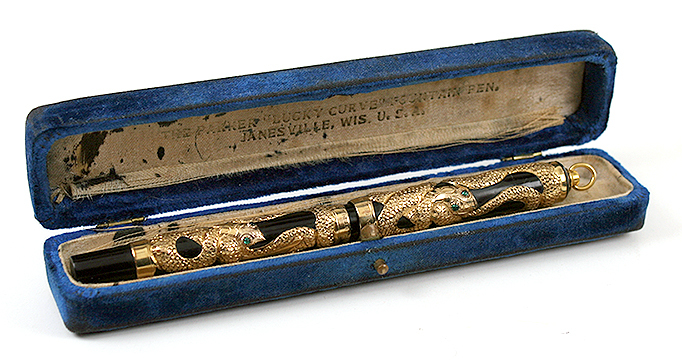 Parker ordered George Heath, a skilled designer of jewelry, to cover a pen with a snake motif, with the motivation of having something eye striking to get his salesmen’s foot into the door of a retailer. The earliest examples have a round cap top and an imprint, just like on this one, which reads “Parker Fountain Pen Pat. 6-30-91 1-3-05 Design Patent Pending.” Even rarer to be found with a ring-top, this being only the second one known. Fine nib. Near mint+. Also made in sterling silver, the Model 37. Interestingly, the original retail price of the gold-filled model was $10.00 while the sterling silver model was only $8.00. This could be the epitome of your collection! Near mint. Close-up of pen in box. 1905 Parker Model 25 “Click-filler” in Black Hard Rubber. NP filler unit. Unusual filling mechanism. The first mechanically filled pen introduced by Parker. Extremely rare, early & short lived. Pressing the top of a bar accessed in a cutout in the barrel releases the filler mechanism which can then be pressed to fill the bladder. Somewhat like the Conklin “Crescent-filler” but with a different locking system than the lock ring. After filling, the user locks the mechanism back in place. Doing so produced a distinctive “click” as it locks. Medium/fine, extra-flexible nib. New-old-stock. Mint. You’ll never find a nicer example! 1906 John Holland Model 52 “Pull-Filler”in gold-fill Repousse on BHR. Unusual filling mechanism. Circles of high repousse roses on an etched “bark” background. Exquisitely beautiful! Sometimes called the “saddle-fill, since it’s a saddle shaped device the user lifts to fill the pen. Holland claims to have started fountain pen manufacture in 1865, and introduced this particular filling mechanism in 1906 (a year after they introduced their “sleeve-fill” pens), and used it until 1918. George Parker was a Holland distributer until he started his own pen company by improving on the Holland feed! Medium/fine, extra-flexible nib. Near mint in original velvet lined, brown leather box (box shows wear). Close-up of pen in box. 1927 Parker Duofold Sr. BF in Mandarin Yellow. GFT. Absolutely beautiful with a deep, crisp banner imprint. Except for the slightest shade of color difference where the barrel was covered by the cap, near mint+. It would be hard to find a nicer example. 1942 Pelikan 101N PIF in Lizard. Light amber barrel. GFT. Medium/fine, flexible nib. Near mint. 1899 Waterman 222 Taper Cap eyedropper-fill in half-covered Sterling Silver Repousse “Chased” pattern (often called “Snail” in the collector community). Medium, extra-flexible nib. Very rare! Indicia beautifully engraved “LN” in script. Deep, crisp cap imprint. Near mint+ (could be new-old-stock). 1930 Waterman Patrician LF in Moss Agate. The pride of the Waterman pen line! GFT. Medium, flexible nib! Near mint. 1929 Waterman Patrician LF in Black Hard Rubber. GFT. This one has a tad of wear to the imprint (fully readable) but the medium/fine, extra-flexible, italic nib is my favorite and writes like a dream! 1925 Waterman 58 LF in Woodgrain Hard Rubber. Much rarer than Red Ripple! GFT. Extra-smooth, broad, flexible nib. New-old-stock. Mint. You’ll never find a nicer example. 1930 Waterman 494 LF in sterling silver “Bay Leaf” overlay. One of Waterman’s most beautiful patterns. Rare. Extra-fine, extra-flexible nib. Barrel indicia engraved “J.J.S.” Outstanding near mint+ condition. 1935 Parker Vacumatic Twist-activated pencil for above set. Near mint. 1936 Parker “Standard” Vacumatic in Silver Laminated. NPT. Double-jeweled model. Visualated barrel. “Lock-down” filler unit. Two-tone, medium nib. Near mint. 1937 Parker Oversize Vacumatic in Green Laminated. GFT. Visualated barrel. “Lock-down” filler unit. Two-toned, broad nib. Near mint+ (could be new-old-stock). 1937 Parker Sr. Maxima Vacumatic in Silver Laminated. NPT. Visualated barrel. Double-jeweled model. Two-toned fine, italic nib. Some wear to the right side of the barrel imprint wear, otherwise near mint. 1939 Parker Sr. Maxima Vacumatic in Red Laminated (rare). GFT. Visualated barrel. Double-jeweled model. Two-toned fine nib. Near mint. 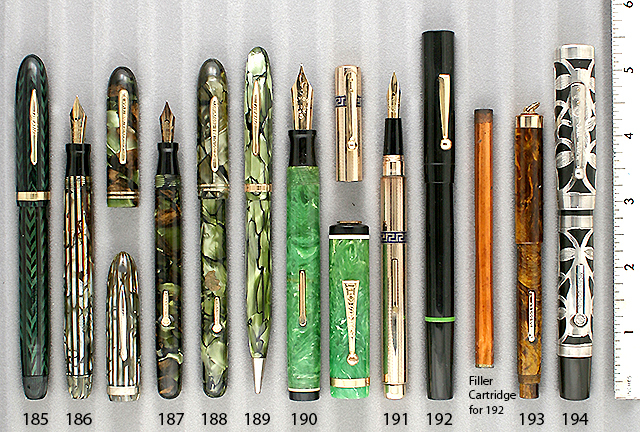 1939 Parker “Standard” Vacumatic in Green Laminated. Very rare clip with the “Star” logo rather than the “Blue Diamond” logo. Parker originally tried to trademark the use of the star on the clip. They were denied, and switched to the blue diamond after only a few months. GFT. Visualated barrel. Two-toned, fine nib. Near mint+. See matching pencil below. 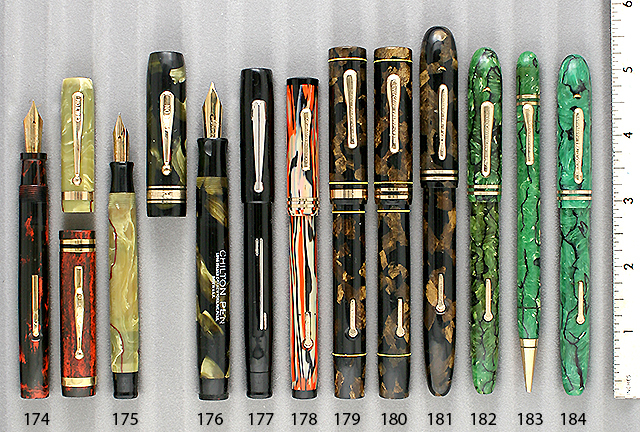 1936 Parker “Standard” Vacumatic twist-operated Pencil in Green Laminated. GFT. Near mint. Matches pen above. Buy with pen above @ $50. 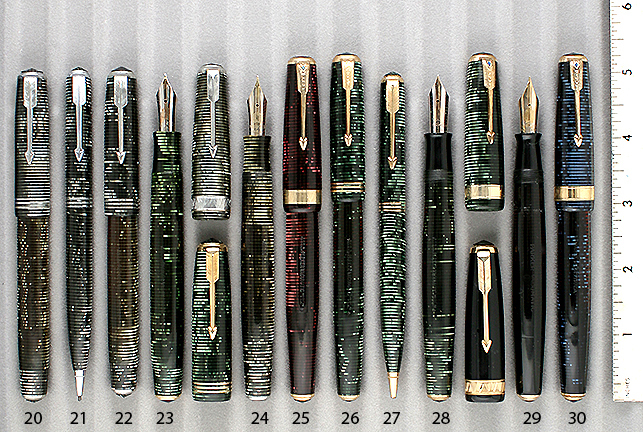 1940 Parker Sr. Maxima Vacumatic in Green Laminated. GFT. Visualated barrel. Double-jeweled model. Two-toned, fine nib. Near mint. 1940 Parker Sr. Maxima Vacumatic in Black Laminated. 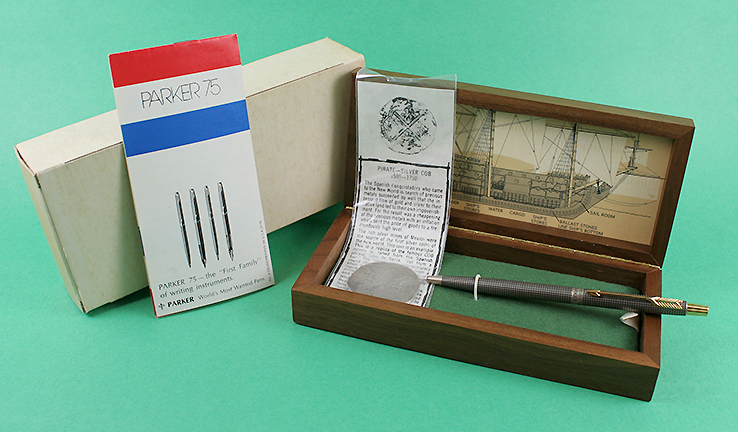 Rare model, produced for Parker by the Chris Olson Pen Company in Denmark, to avoid import duties into Europe. Short lived. The barrel sports the Olson “Anchor” logo in a circle. GFT. Visualated barrel. Double-jeweled model. Two-tone, medium nib. Near mint. 1940 Parker Sr. Maxima Vacumatic in Blue Laminated. Very rare, as it had less than a one-year production run. Even rarer because, along with the normal barrel imprint, it also reads “Marca Registrada” showing it was made for the Spanish market! GFT. Visualated barrel. Double-jeweled model. Fine nib. Near mint. 1940 Parker Major Vacumatic in Green Laminated. GFT. Double-jeweled model. Two-toned, medium nib. Visualated barrel. Near mint+. See matching pencil below. 1941 Parker Major Vacumatic twist-activated Pencil in Green Laminated. GFT. Near Mint. Matches pen above. 1940 Parker Major Vacumatic in Silver Laminated. GFT. Double-jeweled model. Visualated barrel. Two-toned, medium nib. Date code worn off of barrel, otherwise near mint. 1940 Parker Major Vacumatic in Golden Laminated. GFT. Double-jeweled model. Visualated barrel. Two-toned, medium nib. Some wear to the date code and “Made in USA” portion of the barrel imprint, otherwise near mint. 1940 Parker Junior Vacumatic in Golden Laminated. GFT. Double-jeweled model. The “Junior” was the same size as the “Major” but had different cap bands and came without the guarantee. Medium/fine nib. User grade, with imprint wear (fully readable) and minor surface scratches. Excellent. See matching pencil below. 1937 Parker Vacumatic Junior Pencil in Golden Laminated. GFT. Matches pens above and item #40 below. Buy with matching pen @ $35. 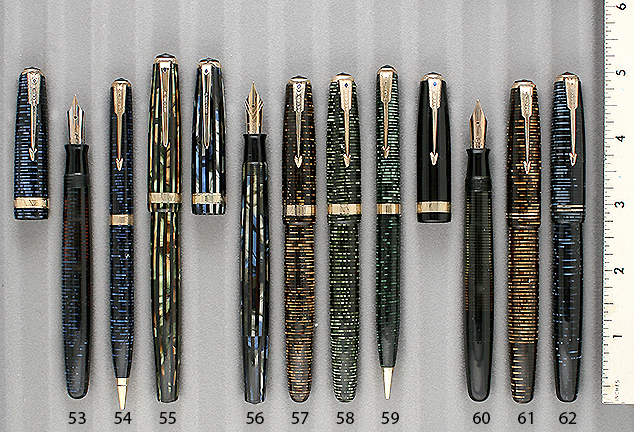 1940 Parker Duofold Jr. Vacumatic Set in Green, Bronze and Black Striped. The “Junior” was the same size as the standard but had different cap bands and came without the guarantee. Medium/fine nib. A tad of wear to the center of the imprint (fully readable) otherwise near mint. 1940 Parker Duofold Jr. Vacumatic Twist-activated pencil for above set. 1941 Parker Major Vacumatic in Golden Laminated. GFT. Double-jeweled model. Visualated barrel. Two-toned nib. Near mint. Two available; (1) Medium nib; (1) Medium/broad nib. 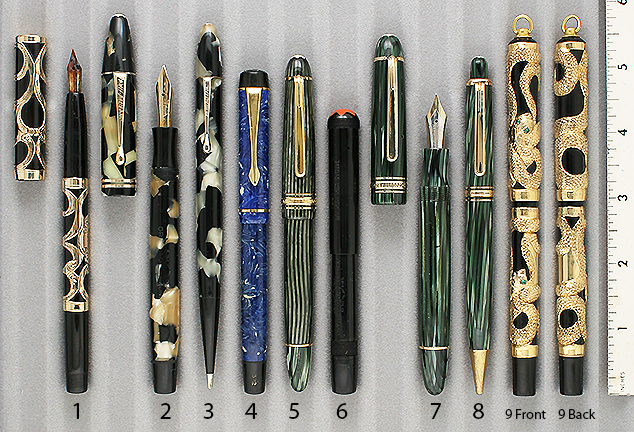 1941 Parker Sr. Deluxe Duofold Vacumatic in Green, Bronze and Black Striped. Rarest model, with the three cap bands, the middle band being wider. GFT. Double-jeweled. Visualated barrel. Fine nib. Near mint. 1941 Parker Major Vacumatic Deluxe in Blue Laminated. The Deluxe models have wider cap bands. 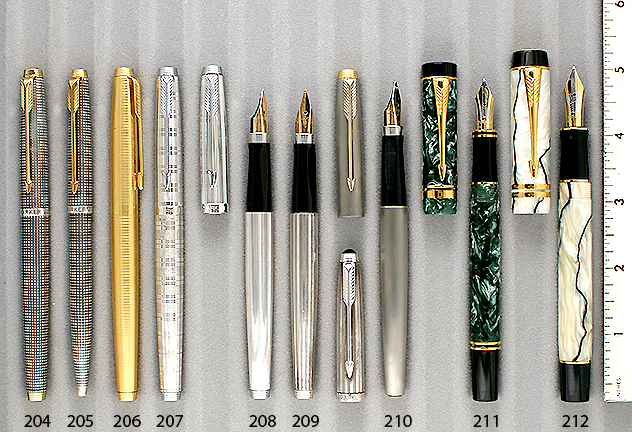 They were made for jewelry stores, so they didn’t compete with the same pens sold in pen shops. GFT. Double-jeweled model. Visualated barrel. Medium nib. Near mint. 1941 Parker Vacumatic Junior in Golden Shadow Wave (rare). GFT. Double-jeweled model. Visualated barrel. Extra-fine nib. Near mint. See matching pencil below. 1938 Parker Vacumatic Junior Pencil in Golden Shadow Wave (rare). 1938 was the year of introduction for the color. GFT. Near mint. Buy with matching pen above @ $50. 1942 Parker Junior Vacumatic in Green Laminated. The “Junior” was the same size as the “Major” but had different cap bands and came without the guarantee. GFT. Visualated barrel. Medium nib. Near mint. See matching pencil below. 1945 Parker Vacumatic Junior twist-activated pencil in Green Laminated. GFT. Matches pen above. Buy with pen above @ $35. 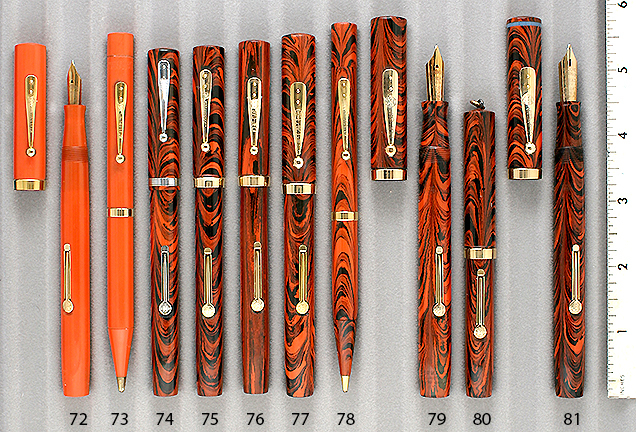 1942 Parker Duofold Vacumatic Set in Red, Silver and Black Striped. GFT, including the wide chased cap bands. Visualated barrel. Fine nib. Near mint. 1942 Parker Vacumatic Twist-activated pencil for above set. 1943 Parker Vacumatic Debutante in Golden Laminated. 1943 models are very rare, as most of the factory production had switched from pens to the war effort. Very few Vacumatics and 51s were produced, and most of those went to the War Department. GFT. Two-toned, fine nib. A smaller model, designed with a cap band chased with arrows. The “Sub-Deb” was a lower price point pen, with a narrower, plain band. Visualated barrel. Near mint. 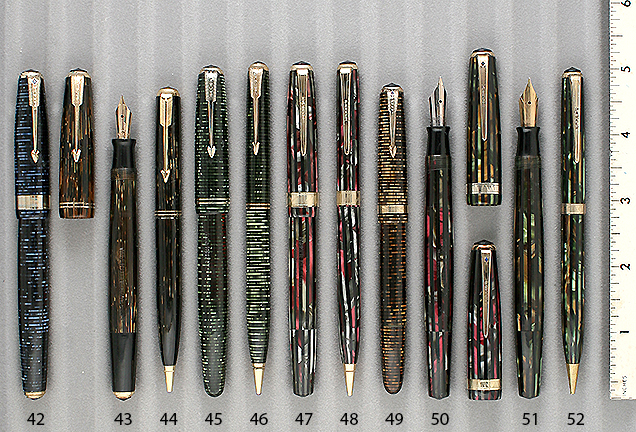 1944 Parker Sr. Duofold Vacumatic in Green, Bronze and Black Striped. GFT. Visualated barrel. Medium nib. Near mint+. See matching pencil below. 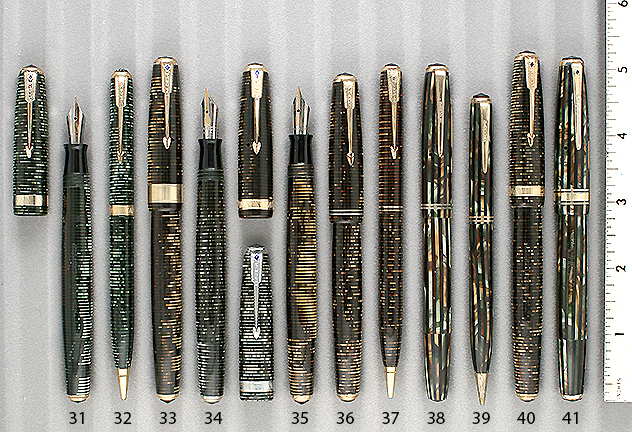 1945 Parker Duofold Vacumatic twist-activated pencil in Green, Bronze and Black Striped. GFT. Matches pen above. Near mint. Buy with pen above @ $35. 1944 Parker Major Vacumatic in Blue Laminated. GFT. Visualated barrel. Near mint+. 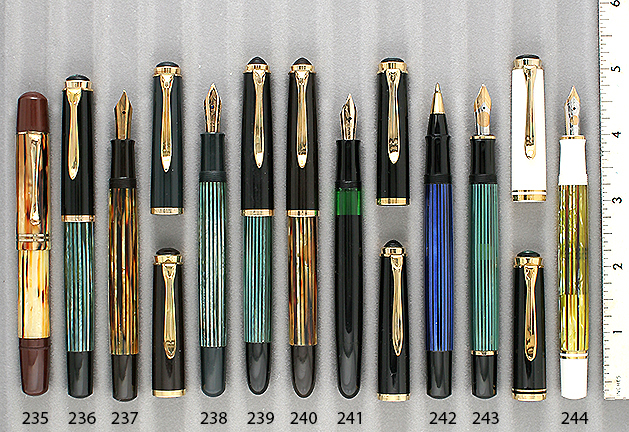 Four available; (1) 1944: Two-tone fine nib; (2) 1945: Medium nib; (1) 1945: Medium/fine nib. See matching pencil below. 1947 Parker Major Vacumatic twist-activated pencil in Blue Laminated. GFT. Near mint. Matches pen above. 1945 Parker Major Vacumatic in Green Laminated. GFT. Medium/fine nib. Visualated barrel. Near mint+. 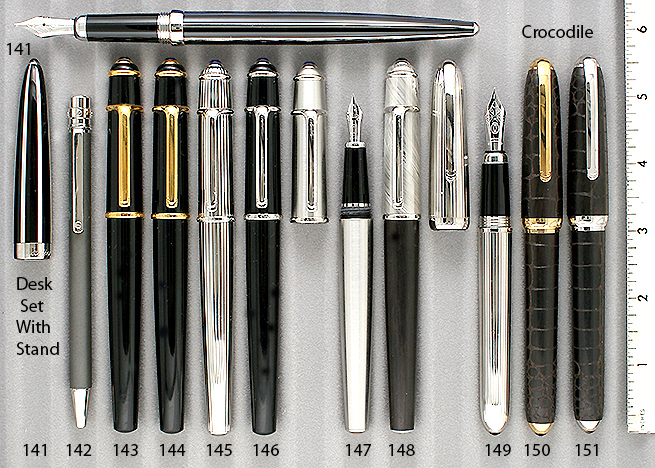 Four available: (1) 1945: Medium nib; (1) 1945: Medium/fine nib; (1) 1947: Medium nib; (1) 1949: Medium nib. See matching pencil below. 1943 Parker Major Vacumatic Pencil in Green Laminated. GFT. Matches pens above. Buy with matching pen @ $50. 1946 Parker Vacumatic Jr. in Golden Laminated. GFT. Medium/fine nib. Near mint with excellent barrel transparency. See matching pencil, item #44 above. 1907 Waterman 14 eyedropper-fill “Cone Cap” (no cap threads) in Black Chased Hard Rubber, with two GF Repousse barrel bands. Extra-fine, triple-flexible nib! Near mint. 1907 Waterman 12 ½ eyedropper-fill in Black Chased Hard Rubber. Fine, extra-flexible nib. New-old-stock. Mint. 1911 Waterman 45 Safety eyedropper-fill in Black Chased Hard Rubber. Stub, italic nib. Near mint. Add $50 for an original Waterman NP signed accommodation clip. 1923 Waterman 42 Safety eyedropper-fill in Red Ripple Hard Rubber. Fine, flexible nib. New-old-stock. Mint. Add $50 for an original Waterman NP signed accommodation clip. 1910 Waterman 12 eyedropper-fill “Cone Cap” (no cap threads) in Black Chased Hard Rubber, with two GF Repousse barrel bands. Fine, triple-flexible nib! Near mint. 1920 Waterman 52 LF in Black Chased Hard Rubber. NPT. Fine, flexible nib. New-old-stock. Mint. 1924 Waterman 56 LF in Black Chased Hard Rubber. NPT. Medium, flexible, italic nib. Near mint. 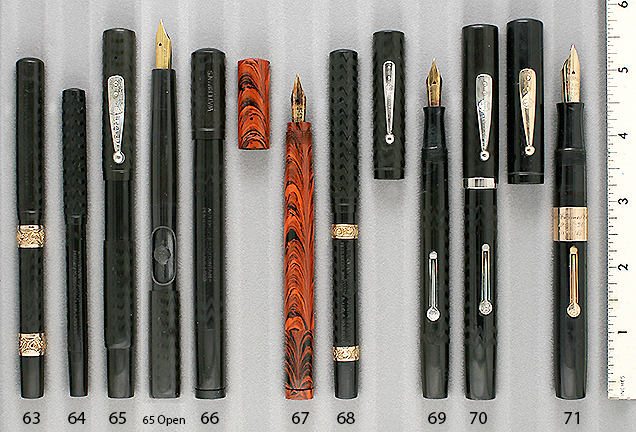 1924 Waterman 755 LF in Black Chased Hard Rubber. 14K solid gold trim. Barrel band engraved “Pres. Cosmos Club 1927-1928 W.C.B.” From their website (https://www.cosmosclub.org/Default.aspx?pageid=31). “The Cosmos Club is a private social club, incorporated in Washington, D.C. in 1878 by men distinguished in science, literature and the arts. In June, 1988 the Club voted to welcome women as members. Among its members, over the years, have been three Presidents, two Vice Presidents, a dozen Supreme Court justices, 36 Nobel Prize winners, 61 Pulitzer Prize winners and 55 recipients of the Presidential Medal of Freedom.” Fine nib, with a touch of flex. Some overall chasing wear, otherwise near mint. 1925 Waterman 52 LF Set in Cardinal Hard Rubber. Very rare – especially in this condition! GFT. Extra-fine, flexible, italic nib. New-old-stock. Except for a slight shade difference where the barrel was covered by the cap, mint in original box. Close-up of set in box. 1925 Waterman 52 Cardinal Twist-activated pencil for above set. 1925 Waterman 52 LF in Woodgrain Hard Rubber (rarer than ripple). GFT Fine, extra-flexible nib. Imprint wear reduces the pen to “Excellent,” but no other defects. 1925 Waterman 55 LF in Red Ripple. GFT. Fine, flexible nib. New-old-stock. Mint. You’ll never find a nicer example! See matching pencil below. 1925 Waterman 52, 54, 55 twist-activated Pencil in Red Ripple. GFT. Near mint. Matches pen above. Buy with pen above @ $75. 1925 Waterman 56 LF in Red Ripple. GFT. Medium, italic nib. Wear to the bottom line of the barrel imprint, otherwise near mint. 1925 Waterman 52V LF Ring-top in Red Ripple. Much rarer than the narrower 51 1/2V normally found. Fine, flexible nib. New-old-stock. Mint. 1927 Waterman 7 LF in Red Ripple with a “Blue” color-coded nib and cap band. Blue designated a Stub, italic nib which, according to Waterman, was “popular with rapid writers.” Rarer, first year model, without the white bookends on the blue band. A little wear to the first line of the barrel imprint (fully readable), otherwise near mint. 1927 Waterman 5 LF in Red Ripple with a “Red” color-coded nib and cap band. 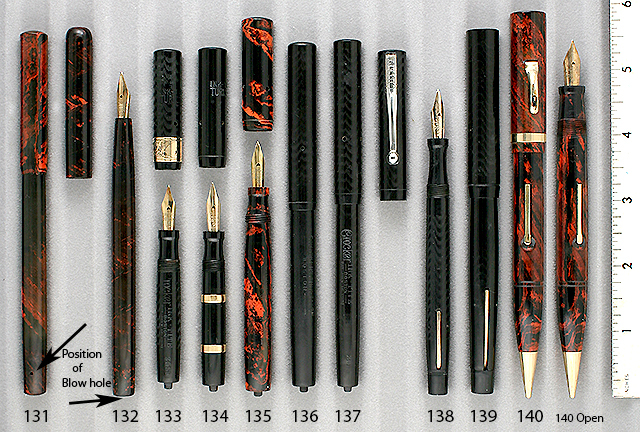 “Red” designated by Waterman as a “Standard, medium, semiflexible” nib. I call them “Extra-flexible.” Two available: (1) Near mint+ @ $475; (1) Imprint wear @ $375. 1928 Waterman 952V LF in Blue-green Ripple (rare). GFT. 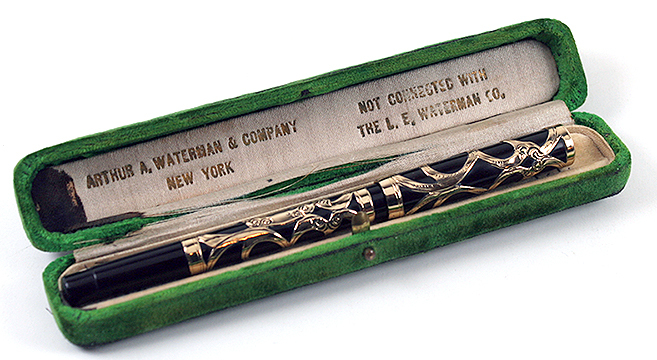 While other manufacturers were switching to Celluloid, Waterman was perfecting their colored hard rubber. A mistake they soon remedied with the 1929 introduction of the Patrician. Fine, extra-flexible nib. A little imprint wear (fully readable) otherwise near mint. 1928 Waterman 94 LF in Blue-green Ripple (rare). GFT and 9K solid gold cap band. 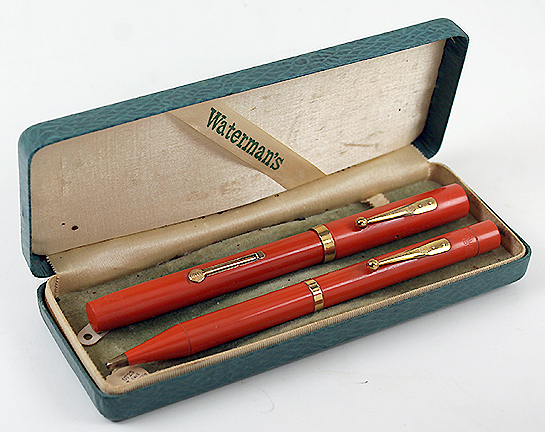 While other manufacturers were switching to Celluloid, Waterman was perfecting their colored hard rubber. A mistake they soon remedied with the 1929 introduction of the Patrician. Fine, extra-flexible nib. A little imprint wear (fully readable) otherwise near mint. 1929 Waterman 52 combination Pen – Pencil in Black Hard Rubber. Waterman combination pens are quite rare! GFT. Broad, extra-flexible, italic nib. Brassing to the upper edge of the cap band, otherwise near mint. 1930 Waterman 42 Safety eyedropper-fill in Red Ripple Hard Rubber. Music Nib! Double-broad, flexible, triple-tined, double vent hole, flexible nib. New-old-stock. Mint. 1930 Waterman 42 Safety eyedropper-fill in Red Ripple Hard Rubber. Artist Nib! Extra-fine, triple-flexible Artist nib. Signed Waterman accommodation clip. Near mint. 1935 Waterman 52 LF in Red Ripple. Very late production, with mid-1930’s “Shovel” lever and barrel imprint. A very hard to find anomaly, especially with no clip or cap band, which would have been standard at that time. Extra-fine, flexible nib. New-old-stock. Mint and beautiful! 1936 Waterman 44 eyedropper-fill Safety in Black Smooth Hard Rubber (quite rare). Music Nib! GFT, including the 2 barrel bands. Double-broad, flexible, triple-tined, double vent hole nib. Near mint. 1936 Waterman Lady Patricia 44 eyedropper-fill Safety in Black Smooth Hard Rubber (quite rare). GFT, including the 2 barrel bands. Fine, flexible nib. Near mint. 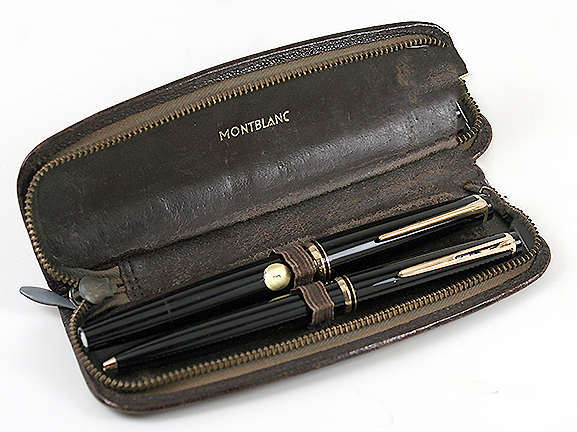 1935 Montblanc 202 Safety eyedropper-fill in Black Hard Rubber. GFT. Fine, flexible nib. A tad of cap band brassing, otherwise near mint. 1939 Montblanc 138 Meisterstuck PIF in Black. GFT. Visualated barrel with perfect black pinstriping. Made for the Italian market (cap tube is imprinted “Fabbricata in Germania”). Two-toned alloy (correct), medium/broad, flexible nib. A touch of brassing to the rear of the cap band and to the nib plating, otherwise near mint. 1944 Montblanc 25 Push-knob fill 12-sided Faceted in Platinum (perhaps Montblanc’s most attractive celluloid). GFT. Correct “Meisterstuck” nib (medium/fine, flexible). 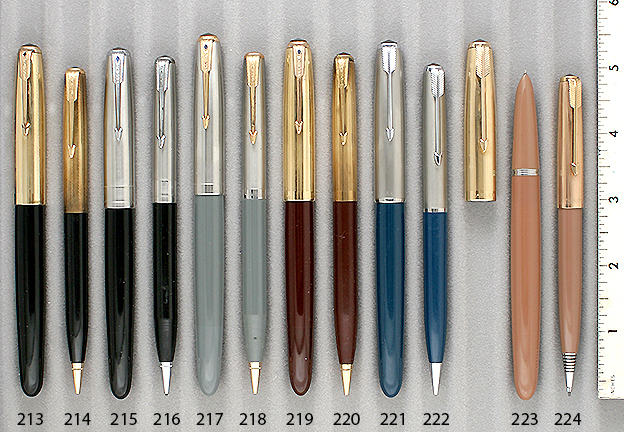 “User Grade” pen, with brassing of the clip and cap band, including each of its 12 points (the celluloid and imprints are near mint). 1946 Montblanc 244 PIF in Silver Striped. GFT. Fine, flexible nib. A tad of brassing to the lower back edge of the clip washer, otherwise near mint. 1946 Montblanc 246 BF in Green Marble (much rarer than it’s counterpart in piston-fill). GFT. Double-broad, flexible, italic nib. Near Mint. 1946 Montblanc 246 BF in Coral Red (rare). GFT. Medium/fine nib. 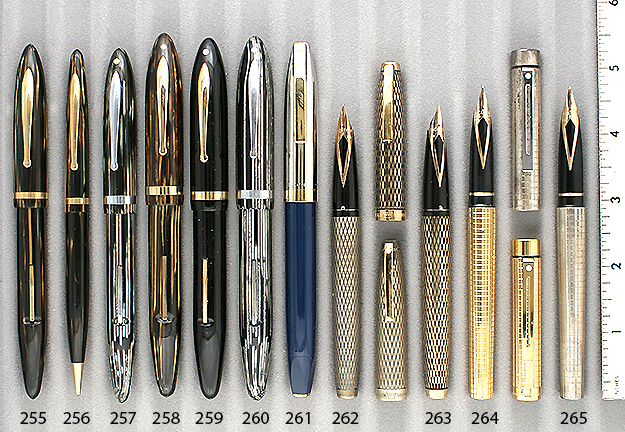 User grade pen with brassing to the clip and cap bands and minor surface scratches to the celluloid visible with a loop. Would otherwise be $800. 1950 Montblanc 642 Masterpiece in Green Striped. GF cap in “Fully Pinstriped) pattern. Visualated barrel. Two-toned, medium/broad, oblique, italic nib (shaped like left foot). Near mint. 1950 Montblanc 642 Masterpiece in Silver Striped. GF cap in “Fully Pinstriped) pattern. Visualated barrel. Two-toned, medium, flexible nib. Some barrel ambering, and a trace of ink in the cap, otherwise near mint. 1950 Montblanc 142 PIF in Black Celluloid (not the later “precious resin”). GFT. Visualated barrel with perfect pinstriping. Two-toned, medium/fine, flexible nib. Near mint. 1952 Montblanc 642 Masterpiece in Black. “Silvexa” (matte chrome plating on steel) cap, with GF band and clip. Visualated barrel with very nice vertical striping. Two-toned, medium, extra-flexible nib. User grade with wear to cap tube (otherwise near mint). 1955 Montblanc 24 PIF in Black. GPT. Visualated barrel. Semi-hooded, medium/fine nib. New-old-stock. Mint. 1955 Montblanc 24 PIF in Black. GPT. Visualated barrel. Semi-hooded nib (double-broad, oblique – shaped like left foot). New-old-stock. Mint. 1955 Montblanc 22 PIF in Black. GPT. Visualated barrel. Fine semi-hooded nib. Near mint. 1955 Montblanc 22 PIF in Black. GPT. Visualated barrel. Fine, semi-hooded nib. New-old-stock. Mint with original label. 1955 Montblanc 22 PIF Set in Black. GPT. Visualated barrel. Fine, semi-hooded nib. New-old-stock. Mint with original label in original leather case. Close-up of set in leather case. 1955 Montblanc “Clip-activated” ball pen for above set. 1955 Montblanc 74 PIF in Black with Gold-filled cap in alternating pinstripe and plain panels pattern. Visualated barrel. Fine, semi-hooded nib. Near mint. 1955 Montblanc 32S PIF in Black with Silvexa cap (brushed plated chrome on steel). GFT. . Visualated barrel. Medium, semi-hooded nib. Near mint. 1969 Montblanc 149 PIF in Black. GPT. Visualated barrel. Tr-color 14C nib. Ebonite feed. Broad nib. Near mint+. 1969 Montblanc 149 PIF in Black. GPT. Visualated barrel. Tri-color 18KC nib. Ebonite feed. Near mint+. Three available: (1) Broad/double broad nib; (1) Medium/broad nib; (1) Broad, oblique nib (shaped like left foot). 1971 Montblanc 220 PIF Set in Black Matte. GPT. Visualated barrel. BB nib. New-old-stock. Mint. 1971 Montblanc 250 button-activated Repeater Pencil for above set. 1971 Montblanc 121 PIF in Black. GPT, including the “wave” cap band. Visualated barrel. Double-broad, italic ,semi-hooded nib. New-old-stock. Mint. 1992 Montblanc Hemingway Ball Pen in Cardinal with Black barrel. GPT. New-old-stock. Mint. No box or papers. 1990 Montblanc 146 PIF in Black. GPT. Visualated barrel. Two-tone 14K, fine nib. Montblanc was still using an ebonite feed at this time (pre-injection molded plastic feed). Near mint. 1991 Montblanc 146 PIF in Black. GPT. Visualated barrel. 14K,extra-fine/fine nib. Montblanc was still using an ebonite feed at this time (pre-injection molded plastic feed). Near mint. 2010 Montblanc 144 Doue cartridge/converter-fill in high polished Stainless Steel. Platinum-plated trim. Two-tone 18K, medium/broad nib. New-old-stock. Mint. Converter included. 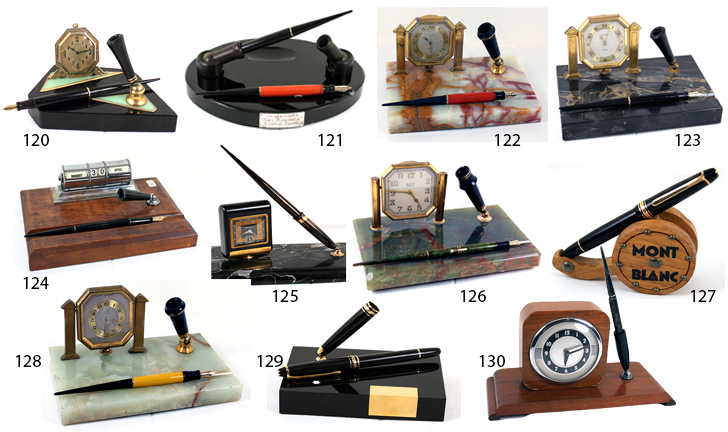 1930 Parker A Page of Vintage Desk Sets Duofold Desk Set in geometrically shaped Black Glass with gold bordered jade geometric shaped applique and working Elgin 30 hour clock. Very Art Deco and beautiful! Black Duofold BF pen. Medium/fine nib. Near mint. Close-up of desk set. 1924 Parker Duofold Sr. Desk Set in Black Glass. Approximately 10″ x 7 1/4″ x 1″ oval shaped, with beveled top edge and groove for an additional pen or pencil. Two hard rubber Duofold Sr. Pens, one in Black and the other in Cardinal. Both with a broad nib and with the 1924 “Medium” size imprint (rare). Sterling Silver plaque applied to the front edge of the base reads “In Appreciation Sales Department Goodyear Canada.1927.” Close-up of desk set. 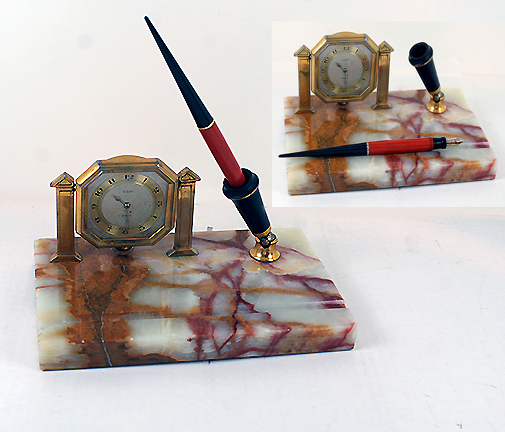 1926 Parker Onyx Desk Set in Ivory and Bronze Pearl with Bronze Veins and 8-Day Elgin Clock which is working perfectly. Approximately 8″ x 5″ x 7/8″ with a groove to hold an additional pen or pencil. Duofold Jr. BF pen in Cardinal with Black taper. GFT. Medium/broad nib. A few very minor edge flakes, otherwise near mint. Without the pen @ $350. Close-up of desk set. 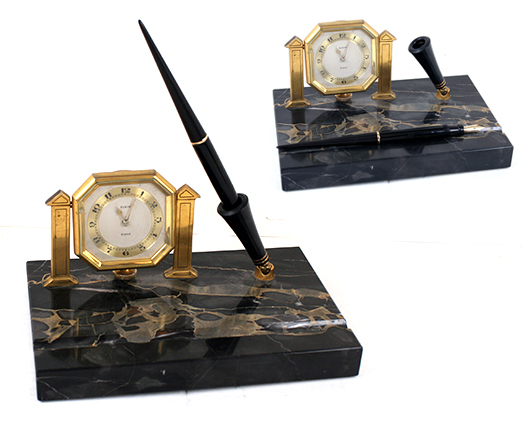 1926 Parker Onyx Desk Set in Black with Bronze Veins and 8-Day Elgin Clock which is working perfectly. Approximately 8″ x 5″ x 1″ with a groove to hold an additional pen or pencil. Duofold Jr. BF pen in Black with Black taper. GFT. Medium nib. A few very minor edge flakes, otherwise near mint. Without the pen @ $350. Close-up of desk set. 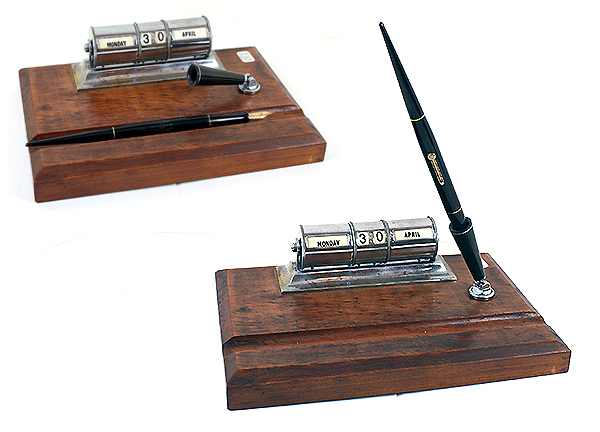 1925 Waterman 55 Desk Set in Wood with Perpetual Calendar in Chrome Plate. Approximately 9″ x 6″ x 1″ with beveled edges and a groove to hold an additional pen or pencil. Black LF pen with NP trim. Fine, triple-flexible nib! Pen is mint, new-old-stock; base is perfect; calendar works perfectly and shows minor wear. Close-up of desk set. 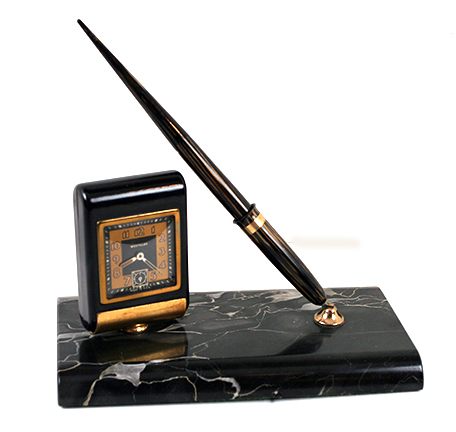 1939 Waterman Onyx Desk Set in Black with White Pearl Veins and Westclox which is working perfectly. Approximately 7″ x 4″ x ½” with rounded front and back edge. 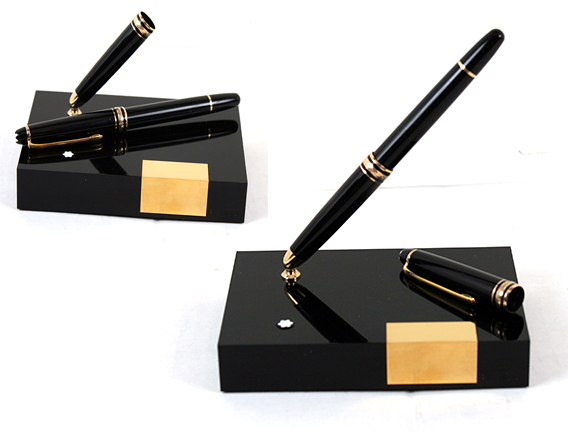 Triumph Touchdown desk pen in Golden Laminated with both matching taper and trumpet. GFT. Medium nib. Rear side of the copper clock-holder wonderfully engraved in rear “Edna from Ralph Christmas 1939.” Close-up of desk set. 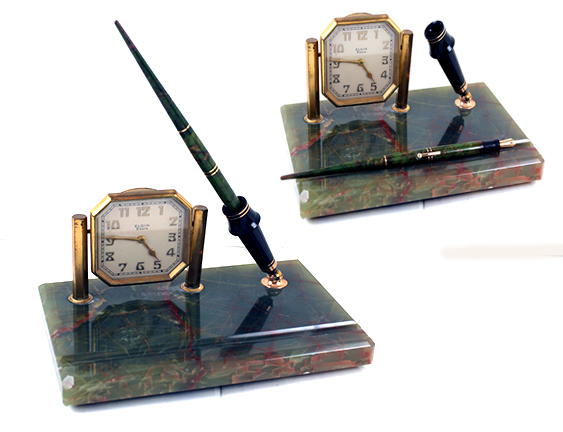 1929 Wahl Eversharp Onyx Desk Set in Green with Bronze and Red Veins and 8-Day Elgin Clock which is working perfectly. Approximately 8″ x 5″ x 1″ with beveled top edges and a groove to hold an additional pen or pencil. #2 Green and Bronze desk pen with matching taper. GFT. Medium nib. A few very minor edge flakes, otherwise near mint. Without the pen @ $350. Close-up of desk set. 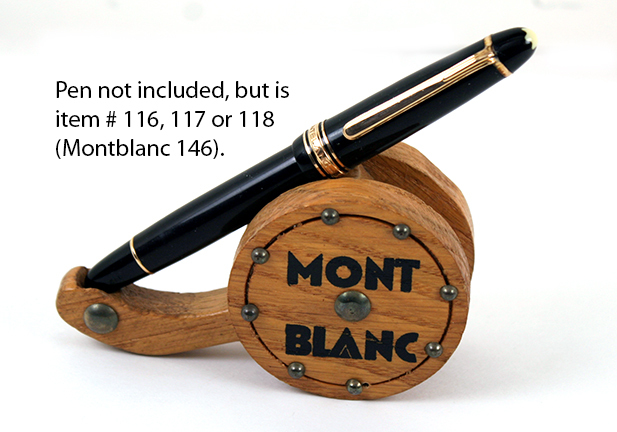 1960 Montblanc Pen Stand in Wood with “Mont Blanc” printed on both “wheels.” Wheel is about 2″; overall length about 4″. Pen is shown for example only, and is not included. Close-up of desk set. 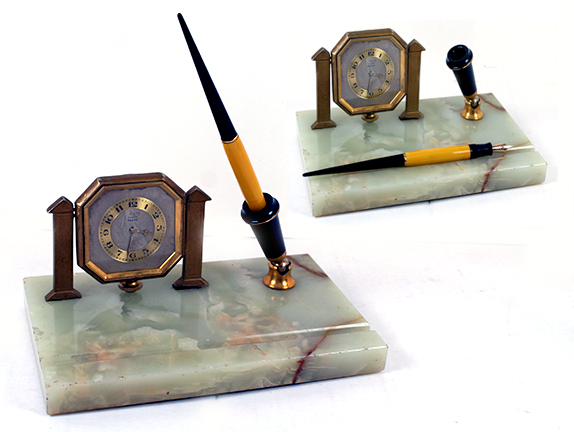 1929 Parker Onyx Desk Set in very Light Green Ivory Pearl with Yellow, White and Bronze Veins and 8-Day Elgin Clock which is working perfectly. Approximately 8″ x 5″ x 7/8″ with a groove to hold an additional pen or pencil. Duofold Jr. BF pen in Mandarin Yellow with Black taper. GFT. Medium/fine nib. A few very minor edge flakes, otherwise near mint. Oddly, the pen has no imprint. Without the pen @ $350. Close-up of desk set. 2010 Montblanc 144 Desk Base in Black (probably “Precious Resin”) with inlaid brass plate (not engraved). Approximately 4 1/4″ x 3″ x 1″. 144 cartridge/converter-fill in Black with 2-tone, medium nib. Converter included. Without pen @ $200. Close-up of desk set. 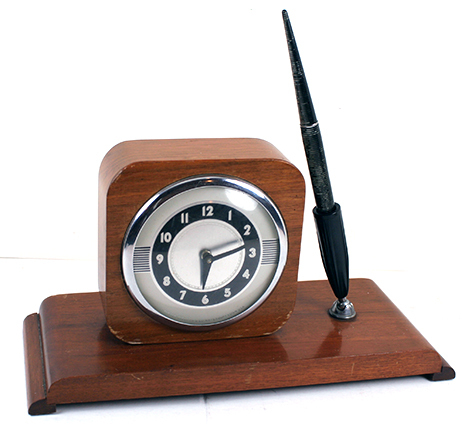 1937 Parker Vacumatic Desk Set in Wood (probably Maple) with very Art Deco Lux Clock (not working). Base approximately 11″ x 4 1/4″ x 1″, including the rounded “legs” on the two short sides. The matching wooden clock frame is approximately 4 1/4″ square and 1 3/4″ deep, with polished chrome trim. Silver Laminated Vacumatic-fill Desk Pen with matching taper. NPT. Medium/fine nib. Near mint. Close-up of desk set. 1905 Crocker #3 Blow-fill in Red Mottled Hard Rubber (very rare). Unusual filling mechanism. The earliest model of the Crocker Blow-fill, with “Patent Pending” as part of the barrel imprint. Yes, the user put the pen into his mouth and blew through a hole on the side of the barrel, not far from the bottom to depress the bladder (shortly after introduction the “blow hole” was moved to the actual bottom of the barrel). Then, with the nib in the ink bottle, the user released the pneumatic pressure and the ink was drawn into the bladder. Eventually, Crocker supplied a rubber syringe (bulb) which fit over the end of the pen to replace the (unsanitary) use of the mouth. When Seth Chilton Crocker left the Crocker Pen Company (owned by his father) and started the Chilton Pen Company (his own company), the blow-filler mechanism was replaced by another pneumatic filling mechanism using a sliding barrel with a hole in the end which the user covered with his or her finger – a big improvement! This is a very early “Cone Cap” example, without cap threads. Extra-fine “Crocker Boston” nib, with no number to designate the size. A few very small flakes out of the cap lip, otherwise near mint+. 1906 Crocker #2 Blow-fill in Red Mottled Hard Rubber (very rare). The “Blow Hole” is now on the very bottom of the barrel. This is a very early “Cone Cap” example, without cap threads. Fine, triple-flexible “Crocker Boston 2” nib. Near mint+. Date approximate. 1910 Crocker #3 Blow-fill Model 25 in Black Chased Hard Rubber. Extra-fine nib with just a tad of flex. Some imprint and chasing wear (imprint easily readable), otherwise near mint. 1917 Crocker #2 Hatchet-fill Model L25S in Black Chased Hard Rubber. NP Clip and GF “Hatchet.” The lever (hatchet), patented by Crocker, was attached to the blind cap and, when unscrewed lifted on a fulcrum so the other end forced the press bar against the bladder to fill the pen. Broad, extra-flexible nib. Near mint. 1917 Crocker #4 Hatchet-fill (could be Model L45S) in Black Chased Hard Rubber. GF clip and “Hatchet.” See the pen above for more information. Medium/broad nib. Some chasing and imprint wear (easily readable) otherwise near mint. 1920 Crocker #4 Lever-fill Pen-Pencil Combination in Red Mottled Hard Rubber (extremely rare!). GFT, including the clip with the spring operated “Shirt Grabber” designed so the pen could not drop out of the user’s pocket. Medium nib. 2000 Cartier Calligraphique (Calligraphy) LE 403/2000 cartridge/converter-fill in Black Onyx and Platinum. Super long (almost 7 3/4″ closed, it comes with an acrylic desk stand. 18K white gold, stub nib. New-old-stock. Mint in original form fitted box with papers, cartridges, converter, desk stand and outer box. Close-up of pen in box. 2007 Cartier Santos Ball Pen in Grey Matte Lacquer. Palladium plated trim. Near mint+ in original box with papers and outer sleeve. Close-up of pen in box. 2010 Cartier Diablo cartridge/converter-fill in Black. GPT. Blue cabochon in cap-top. Two-toned, 18K, medium/broad nib. Some scratches to the clip and barrel noticeable with a loop, otherwise near mint. A great daily user. Converter included. 2010 Cartier Diabolo Roller Ball in Black. GFT. Blue cabochon in cap-top. Near mint+ in original box with papers and outer sleeve. Close-up of pen in box. 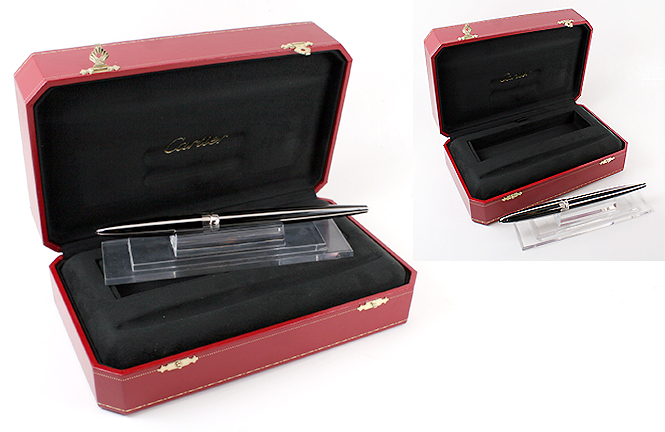 2010 Cartier Diabolo cartridge/converter-fill in Platinum-plate in Pinstripe. White gold 18K, medium/broad, white gold nib. Near mint+. Converter included. 2010 Cartier Diabolo Rollerball in Black Composite. Polished Platinum-plate trim. Blue cabochon mounted at the top of the cap. New-old-stock. Mint. 2010 Cartier Diabolo de Cartier Ebony & Damas LE 42/1000 Cartridge//Converter-fill with Ebony barrel and Etched Damas Steel Cap and Gripping Section. Polished Platinum-plate trim. Blue cabochon mounted at the top of the cap. 18K white gold, medium nib. New-old-stock. Mint. Converter included. 2010 Cartier Dandy Ebony and Crocodile cartridge/converter-fill LE 0345/1847. Matching gold-plate gripping section, barrel threads, cap and barrel trim. Two-tone 18K, fine nib. New-old-stock. Mint. Converter included. 2010 Cartier Dandy Ebony and Crocodile cartridge/converter-fill LE 0650/1847. Matching platinum-plate gripping section, barrel threads, cap and barrel trim. 18K white gold, fine nib. New-old-stock. Mint. Converter included. 1929 Aurora “Rapid” #4 size Safety eyedropper-fill in 18KR Rolled-Gold (called “gold-filled” in the US). Very rare pattern, with wide alternating White and Yellow 18K rolled-gold spiral filigree panels. Rollerball clip. Correct, Warranted 14K, medium/broad, flexible nib. Near mint. 1928 Aurora R. A. 5 Safety on Black Hard Rubber. Extremely rare and early. GFT, including the floral design clip washer. Fine nib. The largest size in which the R. A. Safety was manufactured. Slight ambering, otherwise near mint. 1929 Aurora A. R. A. 2 LF in Red Mottled Hard Rubber. GFT. Broad, extra-flexible nib.”FIAT” (the world famous Italian auto company) die cut into the front of the cap band. Near mint+. 1935 Aurora Superna Large BF in Black. The largest size in which this model was made. GFT, including the “floral guilloche” center cap band. Fine, triple-flexible nib. Near mint. 1940 Aurora Novum Medium LF in Golden Pearl Web (beautiful). GFT. “Vacumatic” style clip with black “jewel.” #3 fine, flexible nib. The Novum is the famous Aurora model with the lever mounted on the very bottom of the barrel. A touch of wear to the very center of the barrel imprint (fully readable), otherwise near mint. 1951 Aurora 88 PIF in Black with 18K Solid Gold “Pinstriped” cap (very rare!). Semi-hooded nib. 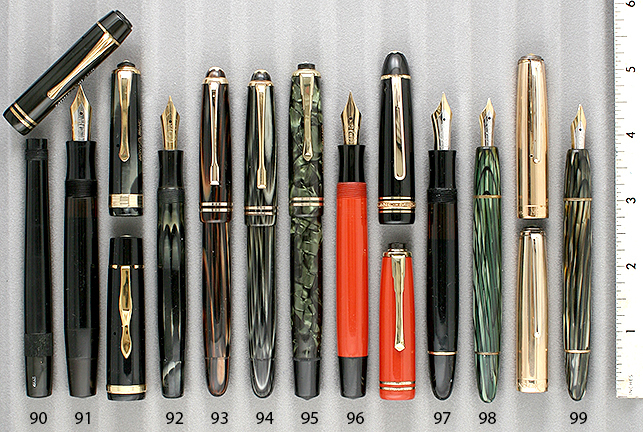 The “88” was designed to compete with the Parker 51, and was immensely popular! Medium/broad nib. New-old-stock. Mint in original leather covered wooden box, the inside cover marked “Aurora Gold Gift.” Box a little threadbare. Close-up of pen in box. 1975 Aurora 88P PIF Set in Black with Gold-plate “Fully Pinstriped” cap. Semi-hooded nib (medium/fine). Visualated barrel with perfect pinstriping. New-old-stock. Mint in original box with papers and outer sleeve. The cover of the box shows an image of the Fiat car factory. Close-up of set in box. 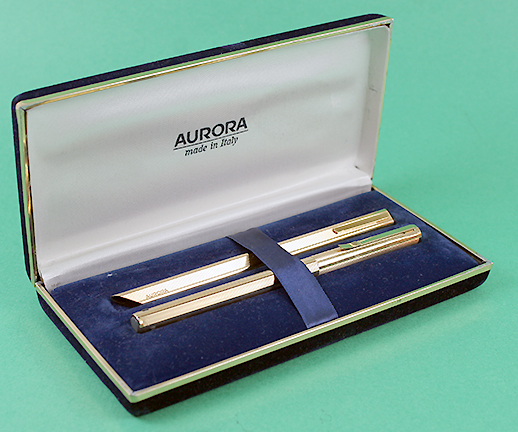 1975 Aurora 88 Cap activated Thesi ball-pen for above set. 1995 Aurora Hastel cartridge/converter-fill set (with Thesi pencil below) in 18K “Pinstriped.” Very rare and beautiful! Broad nib. 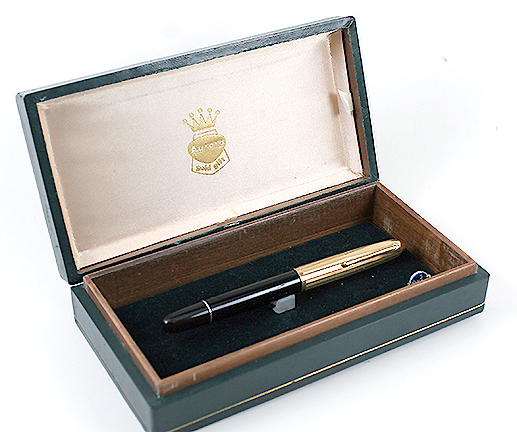 Pen is mint, new-old-stock, in form-fitted, velvet lined box. Converter included. Close-up of set in box. 1995 Aurora These Ball Pen in 18K “Pinstriped” for above set. The famous “flat design” which was selected for permanent display at the Museum of Modern Art. Has been used, with minor dings and surface scratches. 1945 Koska #5 size PIF in Silver Laminated celluloid. In the 1950’s Parker was added to their customer list. GFT. Broad nib. Highly visualated barrel. Correct “Warranted 14 Cts 1st Quality C5” nib. New-old-stock. Mint. 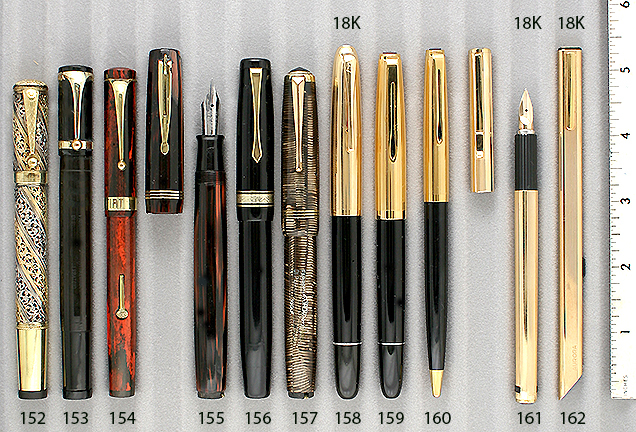 1933 Omas Extra Lucens Faceted Medium plunger-fill in Golden Laminated (like Parker Vacumatic). GFT. Fine, extra-flexible nib. Near mint. 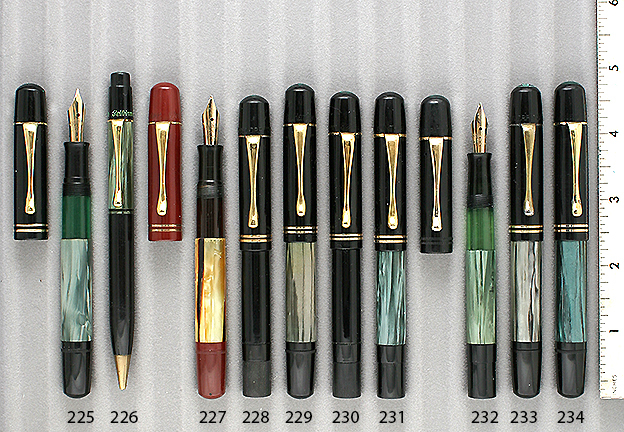 1935 Omas/Pagliero Plevonia BF in Green Laminated (Parker Vacumatic look-a-like), set off with Black ends. Almost certainly made by Omas for Pagliero – see, for example, Omas item #34 above for an almost identical pen, inside and out. Also, Pagliero produced mid-range pens in their factory, and this is clearly a very high end pen. This can also explain the Omas Extra nib (medium/fine, extra-flexible) found in the pen. GFT, including the wide center “Greek Key” cap band and rollerball clip. This is the only size in which the Plevonia was manufactured. Near mint. 2009 Omas 360 Rollerball Large Cranberry Red. NPT with “Greek-Key” lower cap band. Matching bands on gripping section. New-old-stock. Mint. 1935 Tabo Transparente Large Vacuum-fill in Black. Long, clear visualated barrel with wide black spiral. Turning the blind cap propels the plunger mechanism to press to fill the pen. Then turn once again to repel the mechanism. GFT. Medium, extra-flexible nib. New-old-stock. Mint. 1939 Tabo Mentis Large BF in Golden Arco (beautiful!). NPT. “Tabo” comes from the first two letters of the founder’s name (Tantini) and the city where the factory was located (Bologna, Italy). The “Mentis” was Tabo’s button-fill pen, made in three sizes, this example being the largest size. CPT. 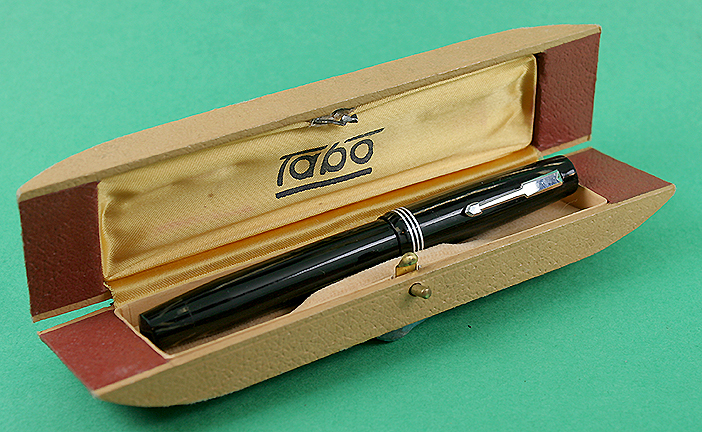 Large, medium, nib (marked “10” by TABO). New-old-stock. Mint in original box. Close-up of pen in box. 1946 Tabo Vertex Vacuum-fill in Blue Arco (beautiful). Very rare model, shortly replaced by the “Tabo V” piston-fill). 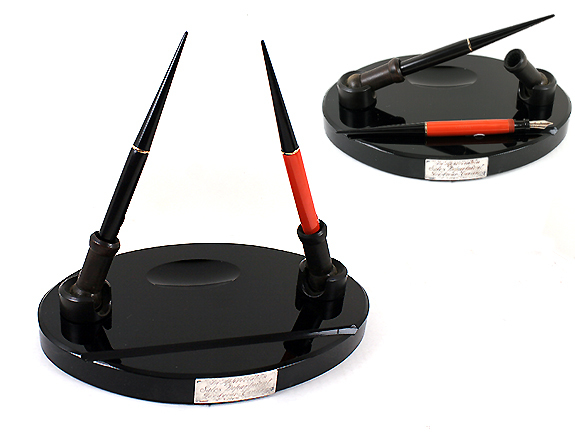 Some Italian pen historians believe these early Tabo pens were made for them by Omas. The largest size in which this model was produced. Turning the blind cap propels the plunger mechanism for pressing to fill the pen. Then turn once again to repel the mechanism. Visualated barrel. Semi-hooded, medium/fine nib. GFT. Military “over-the-top” clip. New-old-stock. Mint. 1947 Tabo “S” piston-fill in Golden Arco (beautiful). GFT, including the chased cap band. Fine, extra-flexible nib. Visualated barrel. New-old-stock. Mint. 1935 Tibaldi Infrangible Series III BF in Green Pearl Marble, set off smartly with Black ends. GFT. Medium, extra-flexible nib. Near mint. 1935 Tibaldi Transparante Extra Piston-fill in Black. GFT. Wide visualated barrel with narrow black spiral. Medium, flexible nib. New-old-stock. Mint. 1928 Carter Superwear Model 4125 (#6 size) LF in Red Mottled Hard Rubber. Carter started producing fountain pens around 1924, but couldn’t make it through the depression and went out of business in 1932. They are also well known for ink. GFT. Fine nib. Near mint. 1932 Chilton Oversize Deco Band Pneumatic-fill in Green Marble. GFT, including the 3 cap bands (wide “Greek-Key” center band). Fine nib. Near mint. 1936 Chilton Wingflow pneumatic-fill in Black with Sterling Silver inlay. The pattern repeats twice on the barrel and once on the cap (on the rear). Fine nib. Near mint. 1927 Conklin #2 LF “Halloween” in Ivory, Orange & Black Veined Celluloid. GFT. Rare, beautiful and highly desirable. Fine, flexible nib. New-old-stock. Mint. 1928 Conklin Long Endura LF in Black & Bronze. GFT (one cap band). Inlaid yellow bands. Fine nib. New-old-stock. Mint. 1929 Conklin Long Endura LF in Black & Bronze. GFT (two cap bands). Inlaid yellow bands. Medium/fine nib. New-old-stock. Mint with original label. 1930 Conklin Endura Symetrik Oversize LF in Black & Bronze. 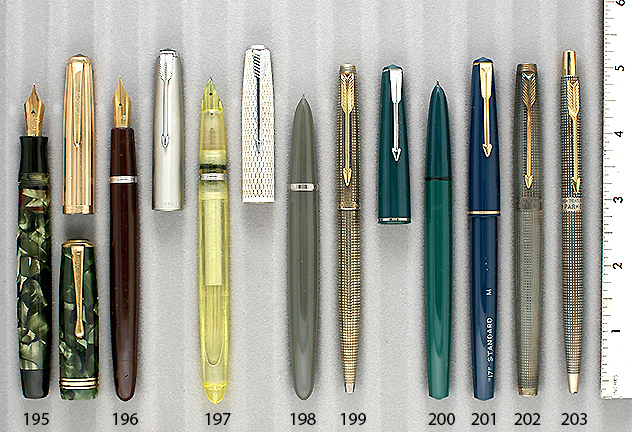 In 1930 Conklin transitioned from the flat-top Endura to the streamlined, Endura Symetrik, as other pen manufacturers re-designing as well. I included the two pens immediately above so you could see the transition from one cap band to two cap bands to the new streamlined shape. The Endura Symetrik was made in three sizes (this being the largest) and was very short lived as it soon transitioned to the piston-filled Nozac. Examples of the Endure Symetrik are rare today. GFT. Medium nib. New-old-stock. Mint. See the next two pens for the other size Endura Symetriks. 1930 Conklin Endura Symetrik Large LF in Green with Black Veins. GFT. Fine, italic nib. Some even overall ambering, otherwise near mint. 1930 Conklin Endura Symetrik Standard LF Set in Green with Black Veins. GFT. Medium nib. Outstanding color! New-old-stock. Mint. 1930 Conklin Endura Symetrik Twist-activated pencil for above set. 1931 Conklin Nozac Standard 14-Sided PIF in Green Herringbone. 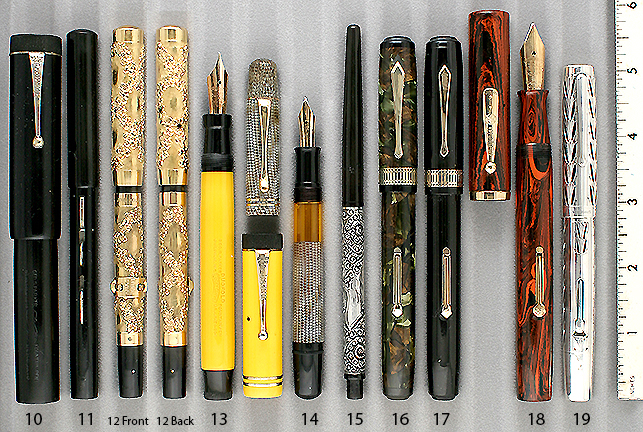 The Nozac was advertised as “the pen which winds like a watch” and were Conklin’s top-of-the-line pens at the time. GFT. Fine nib. New-old-stock. Mint. 1932 Conklin Nozac PIF 12-Sided 5M Word Gauge in Grey Pearl with Black Stripes. Taking advantage of the visualated barrel, and to promote it’s large capacity, Conklin imprinted a gauge running up the side of the barrel to show how many words the remaining ink would write. The gauge on this model runs from 1M (thousand) to 5M. NPT, including the chased cap band. Fine nib. Minor wear to the barrel imprinting (fully readable) otherwise near mint. 1931 Conklin #2 LF in Moss Agate (rare). GFT. Fine, italic nib. Near mint. 1927 Diamond Point #8 LF in Jade with White and Black ends. GFT. Made by National Pen Products, Diamond Medal was a Sears, Roebuck “House Brand” for their high quality pens. Medium/fine nib. An applied metal plaque on the cap-top sports the letter “C” in an oriental motif. Near mint. 1920 Edward Todd #2 LF Straight Holder in Gold-filled. The pattern is alternating wave chased and plain panels, with (1) 3/16″ inlaid sterling silver band with inlaid blue enamel in a Greek Key design. Edward Todd started out as a partner in Mabie, Todd & Company and went off on his own at the beginning of the 1870’s, introducing his first fountain pen in the early 1880’s. The company didn’t survive the depression. Fine, flexible nib. Near mint+. 1922 John Hancock. #4 cartridge-fill in Black Hard Rubber. Unusual filling mechanism. 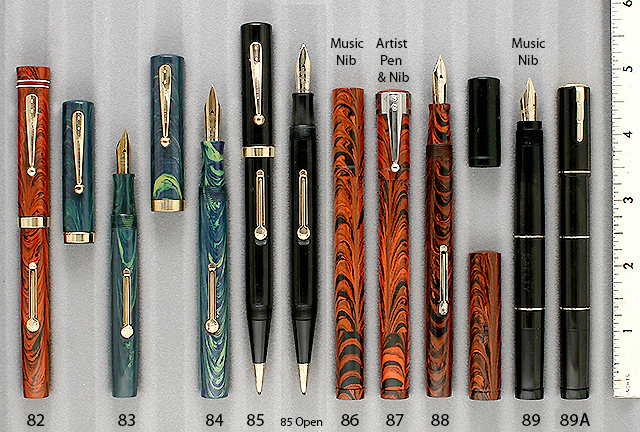 Cartridge-filling pens started showing up in the market in the 1920’s. In late 1921, The Pollock Pen Co. was founded and applied for a patent for a pen using a long copper cartridge which screwed into the gripping section. 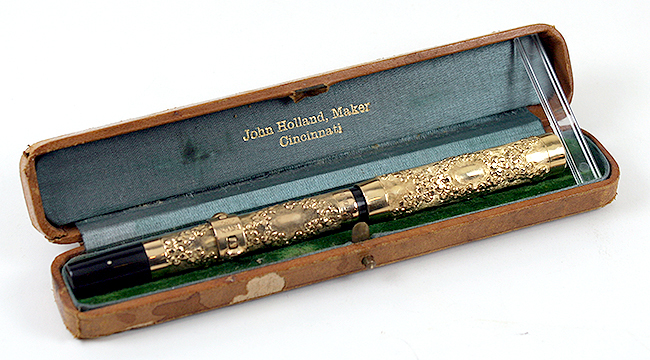 Pollack called the pen the “John Hancock,” one of the first cartridge pens ever marketed. The patent was actually awarded about 8 years later. GFT. Jade band at the seam where the blind cap unscrews for access to the cartridge (later production used a red band). Extra-smooth, extra-fine, flexible nib. Near mint+. 1928 Leboeuf #3 LF ring-top in Bronze Pearltex. GFT. The cap screws both onto the top and bottom of the pen. Fine nib. Near mint. 1925 Morrison #8 LF in Sterling Silver “Filigree” overlay on Black Hard Rubber. The largest Morrison overlay I have seen (and perhaps Morrison the rarest!). Medium nib. Light overall ambering of the hard rubber. Some minor surface scratching of the overlay noticeable with a loop, otherwise near mint. 1938 Penol Model 8K 12-sided BF in Green Pearl with Black Veins and Black blind cap. GFT, including the “washer” clip and 3 cap bands, the center band being wider. Penol started in 1930, with each pen made by hand. 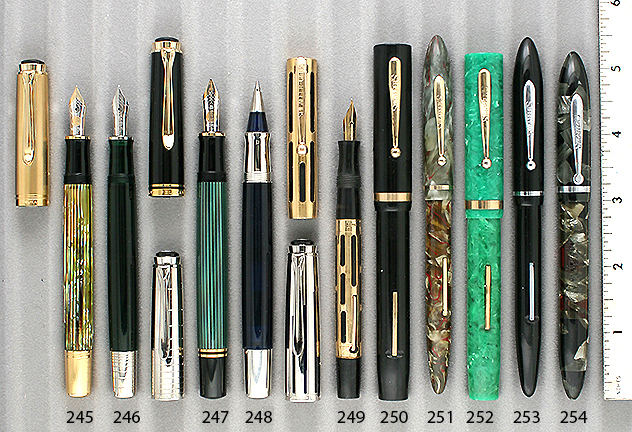 As a result, each pen is unique with respect to size, shape, imprint, assembly, feed, section, nib, and clip. They continued producing, even during the German occupation in the early 1940s. Fine, extra-flexible nib. Near mint. 1947 Parker “VS” (Very Special) BF in Brown. Special color manufactured for Parker in Denmark by Chris Olson and never produced in the US. “Rolled-Gold” cap (what we call “Gold-Filled in the US) in alternating pinstriped and plain panels pattern (gold caps are very rare for the VS). Aluminum button filler. Medium, flexible nib. 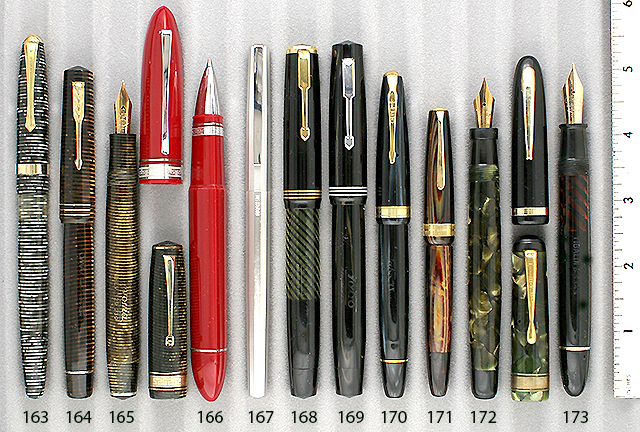 The VS was the successor to the Vacumatic, and sold far better in Europe than in the US. Some minor signs of use. 1949 Parker/Kullock 51 Aerometric-fill components within an Ariel Kullock made Light Yellow Transparent Demonstrator. Brushed Lustraloy (stainless steel) cap. Medium nib. New-old-stock. Mint with perfectly clear plyglass. 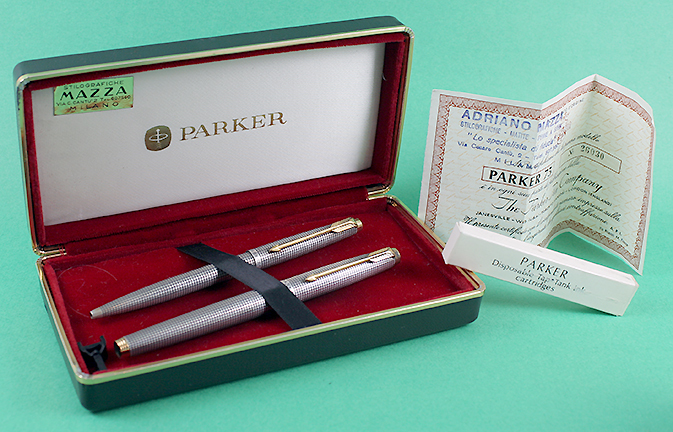 1964 Parker 75 cap-activated Ball Pen in Vermeil (Gold-fill over Sterling Silver). Rare. Near mint+ (could be new-old-stock). 1964 Parker 17 Aerometric-fill in Dark Green. CPT. Manufactured in England, few ever made their way to the US. Fine nib. New-old-stock. Mint with a perfectly clear plyglass. 1964 Parker 17 Aerometric-fill in Dark Blue. CPT. Manufactured in England, few ever made their way to the US. Broad nib. New-old-stock. Mint with a perfectly clear plyglass and original barrel decal. 1965 Parker 75 Spanish Treasure cartridge/converter-fill in Sterling Silver. The first Limited Edition fountain pen ever produced! New-old-stock. 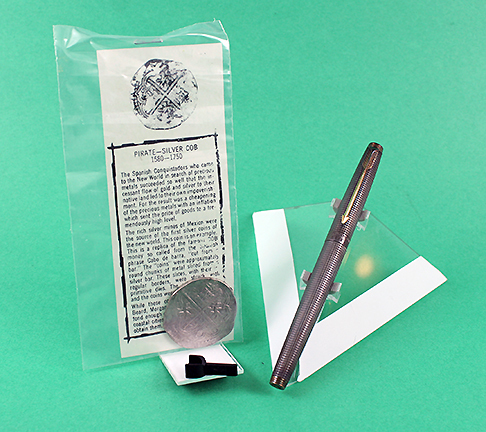 Mint with certificate of authenticity rare doubloon coin with parchment description, and nib adjustment tool. No box. “66” (medium) nib. Converter included. Pen has original patina (will polish on request). I can provide a mint ball pen box with the pen for $50 additional. Close-up of pen, coin & parchment. 1965 Parker 75 Spanish Treasure Ball Pen in Sterling Silver. The first Limited Edition ball pen ever produced! New-old-stock. Mint in the original box with papers and rare doubloon coin with parchment description. Pen has original patina (will polish on request). No certificate of authenticity. Close-up of pen in box. 1965 Parker 75 C/C set in Sterling Silver Cisele “crosshatch” pattern. GFT. Early model with flat ends, short-feathered arrow clip, section angle indicator with “0” at center, “65” (fine) nib. Box includes brochure and a Parker Pen Company serial numbered certificate of Authenticity stamped by the (in Italian), Adriano Mazzi, a famous shop in Milan, boxed cartridges and a nib wrench. Made in USA for the Italian market, with the serial number (matching the certificate) imprinted into the side of the gripping section. Converter included. New-old-stock. Mint in original red velvet lined black leather box. Close-up of set in box. 1965 Parker 75 Cap-activated ball pen for above set. 1974 Parker 75 Place Vendome Cisele in Gold-Plate “Small Squares.” Medium nib. Near Mint.. Converter included. 1976 Parker 75 Place Vendome Prince de Galles in Silver Electroplate. “Plaid” pattern. Extra-fine nib. Some signs of use. Excellent. Converter included. 1980 Parker 75 Place Vendome Millerais in Silver Electroplate. “Pinstriped” pattern. Medium nib. Near mint. Converter included. 1983 Parker 75 Place Vendome Florence in Sterling Silver. Alternating Pinstripe and Plain Panels pattern. Blue cabochon in the cap-top. Double-broad nib. Slightest brassing of the bottom tassie, otherwise near mint. Converter included. 1970 Parker 75 Titanium cartridge/converter-fill in Titanium. A rare pen. “Dished” tasse in cap top. Red “jewel in the barrel bottom. Medium nib. New-old-stock. Mint. Converter included. 1994 Parker Duofold International cartridge/converter-fill in Green Marble. GPT. The two-tone 18K nib is marked “M” but seem to me to be closer to broad. New-old-stock. Mint. Converter included. 1997 Parker Duofold Centennial in Pearl & Black. GPT. 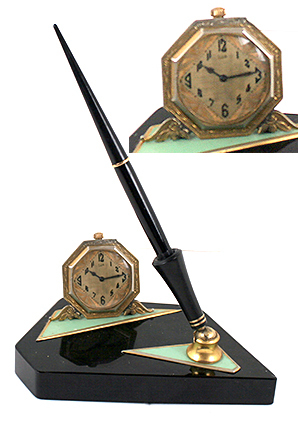 Rare two-tone 18K, “87” nib (fine, oblique – shaped like left foot). New-old-stock. Mint. Converter included. 1945 Parker 51 Vacumatic Blue Diamond Set in Black with gold-filled cap. Caps are 1/10 14K GF in the alternating wavy lines, pinstriped and plain panels pattern. Medium/fine nib. Near mint. 1945 Parker 51 Twist-activated pencil for above set. 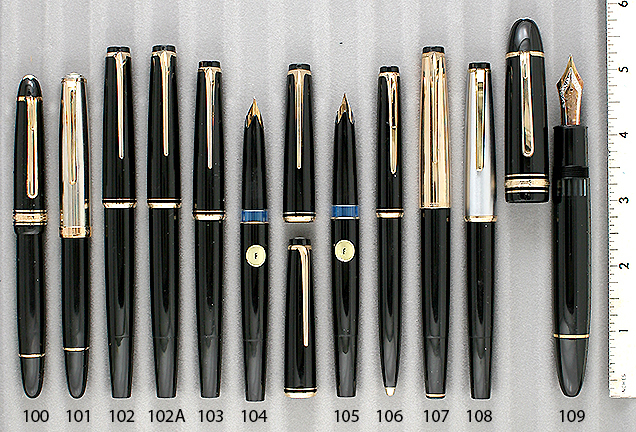 1946 Parker 51 Vacumatic Blue Diamond Set in Black with Brushed Lustraloy (stainless steel) caps with the wide, raised, integrated cap bands (sometimes called the “Stacked coin” band). Medium/fine nib. A few cap surface mars noticeable with a loop, otherwise near mint. 1946 Parker 51 Vacumatic Blue Diamond Set in Dove Grey. Brushed Lustraloy with GF clips Medium. Near mint. 1948 Parker 51 Vacumatic Blue Diamond Set in Cordovan Brown. 1/10 16K GF caps in the alternating 4 pinstriped and plain panels pattern. Fine nib. Near mint+ (could be new-old-stock). 1948 Parker 51 Twist-activated pencil for above set. 1951 Parker 51 Aerometric Set in Teal Blue. Brushed Lustraloy (stainless steel) caps. Fine nib. Near mint+ with no signs of use and a perfectly clean plyglass. 1951 Parker 51 Twist-activated pencil for above set. 1953 Parker 51 Aerometric Set in Buckskin (Beige). 1/8 14K GF caps in the “Fully Pinstriped” pattern. Fine nib. Near mint+ with no signs of use and a perfectly clean plyglass (could be new-old-stock). 1953 Parker 51 Cap-activated pencil for above set. 1937 Pelikan 100N PIF in Green Pearl with Black cap. GFT. Green acrylic barrel. Visualated window. Medium nib, with a touch of flex. Near mint+. See matching pencil below. 1937 Pelikan 200 “Auch Pelikan” repeater button-activated pencil in Green Pearl. GFT. Near mint. Matches pen above. 1937 Pelikan 100N PIF in Tortoise with Red cap, inner cap and turning knob. Amber celluloid visualated barrel. Fine, flexible nib. Near mint. 1938 Pelikan 100C PIF in Black. Acrylic barrel. GFT. Knurled turning knob. Visualated barrel. Medium, flexible, wartime Chromium Nickle nib (many folks believe these write better than the gold nibs!). Near mint. 1938 Pelikan 100N PIF in Grey Pearl (rare) with Black cap. GFT. Green acrylic barrel. Visualated window. Medium/fine nib, with a touch of flex. Near mint. 1942 Pelikan 100 PIF in Black. Acrylic barrel. GFT. Knurled turning knob. Visualated barrel window. Medium/fine, flexible nib. A few minor scratches to the barrel window from the piston gasket, otherwise near mint. 1942 Pelikan 100 PIF in Green Pearl with Black cap. Acrylic barrel. GFT. Smooth turning knob. Visualated barrel window. Fine, flexible nib. Near mint+ (could be new-old-stock)..
1942 Pelikan 100 PIF in Green Pearl with Black cap. Rare cap, made only for the German market (no export) with two chased bands instead of Gold-filled bands. Acrylic barrel. GFT. Smooth turning knob. Visualated barrel window. Medium, extra-flexible nib. New-old-stock. Mint in original box (no papers). Close-up of pen in box. 1953 Pelikan 100N in Dark Green Pearl/ GFT. Green acrylic barrel. Visualated window. Fine, flexible nib. Near mint. 1953 Pelikan 101N PIF in Tortoise (rare) with matching cap. Correct brown celluloid inner cap and turning knob (these are rarer than the Red Rubber inner cap and turning knob). Green acrylic visualated window. GFT. Medium/fine nib. New-old-stock. Mint. 1950 Pelikan 400 PIF in Green Striped with Black cap. GFT. Visualated barrel.. Near mint+. Three available: (1) Nib is factory marked “F” but writes more like a medium/fine; (1) Broad, oblique (shaped like left foot); (1) “DF” Fine, manifold. 1950 Pelikan 400 PIF in Brown Striped with Brown cap. GFT. Visualated barrel. Fine nib. Near mint. 1955 Pelikan 400N (rare) PIF in Green Striped with BLUE cap and turning knob (extremely rare!). GFT. Visualated barrel. Medium, oblique, italic nib (shaped like left foot). Near mint. 1956 Pelikan 400NN PIF in Green Striped with Black cap. GFT. Visualated barrel. Near mint. Two available: (1) Nib factory marked “OB,” but to me is really double-broad, oblique, italic (shaped like left foot); (1) Fine nib. 1956 Pelikan 400NN PIF in Brown Striped with Brown cap. GFT. Visualated barrel. Near mint. Two available: (1) Medium/fine, oblique; (1) extra-smooth broad. 1973 Pelikan 400NN made for Pelikan by Merz & Krell PIF in Black. Has a shorter barrel than the 400NN manufactured in the Pelikan factory, and also no step between the turning knob and barrel. GFT. Medium nib. Visualated barrel. New-old-stock. Mint. 1985 Pelikan R400 Rollerball in Blue Striped. GPT. New-old-stock. Mint. 2000 Pelikan M400 PIF in Green Striped. GPT. Visualated barrel. Two-tone 18C, broad, oblique nib (shaped like left foot). New-old-stock. Mint. 2010 Pelikan M400 PIF in Tortoise (Brown Striped) with White Cap and Turning Knob. GPT. Visualated barrel. Two-tone 14C, extra-fine nib. New-old-stock. Mint. 2010 Pelikan Souveran M450 PIF in Tortoise (Brown Striped) with Pinstriped gold-plated cap and turning knob. Two-tone 18C, extra-fine nib. New-old-stock. Mint. 2010 Pelikan Souveran M425 PIF in Translucent Green with Sterling Silver “Banded” cap and turning knob. White gold, 18C, fine nib. New-old-stock. Mint. 1990 Pelikan Souveran M600 PIF in Green Striped. GPT. Two-toned 14C, broad nib. New-old-stock. Mint. 2010 Pelikan Souveran R625 Rollerball in Dark Blue with polished Sterling Silver cap and turning knob. Cap with various length blue enamel pinstriping coming up from the cap lip. New-old-stock. Mint. 1928 Sheaffer Lifetime Flat-Top Large LF in Black. GFT. Broad, italic nib (very rare for a Sheaffer!). Near mint. 1933 Sheaffer Lifetime Flat-Top Large LF in Jade (outstanding color!). GFT. Medium/fine nib. Near mint+. 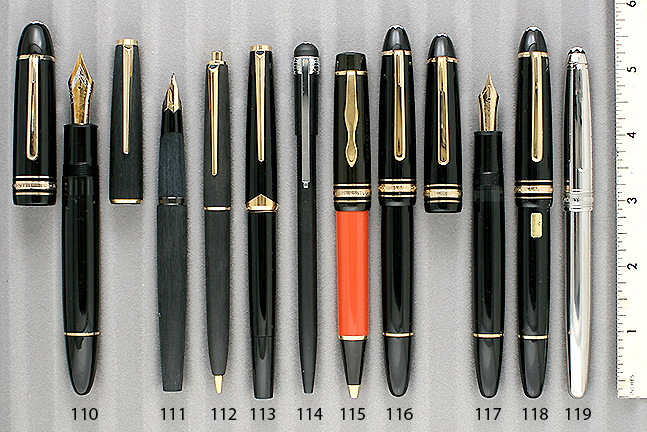 1933 Sheaffer 3-25 Balance full-length (thin) LF in Black. NPT. Fine nib. Near mint. 1936 Sheaffer Feather Touch 7 Vac-fill in Grey Marble. NPT. This pen has three things going for it: (1) rare color – Grey Marble; (2) Rare Size – have you seen a #7 Feather Touch before (or only #5), and (3) even the nib is imprinted “Feather Touch 7.” Extra-fine nib. There is some trim wear noticeable with a loop, otherwise near mint. 1937 Sheaffer #500 Feather-Touch LF Set in Golden Striped. GFT. Visualated section. Medium nib. Near mint. 1937 Sheaffer 1000 Lifetime Balance LF in Silver Striped. NPT. Extra-fine/fine nib. User grade pen because of wear to the trim, otherwise near mint. 1937 Sheaffer Lifetime Balance Large LF in Golden Striped. GFT. Near Mint. Two available: (1) Fine nib; (1) Medium nib. 1937 Sheaffer Lifetime Balance Large LF in Black. GFT. Broad nib. Near mint. 1937 Sheaffer Lifetime Balance Large LF in Silver Striped. NPT. Medium/fine nib. Some trim wear, otherwise near mint. 1959 Sheaffer PFM IV Snorkel-fill in Blue with Polished Chrome cap and GFT. The label says “Fine” but I characterize it more as medium/fine. New-old-stock. Mint with original decal (hard to read) and nib size label. 1960 Sheaffer Imperial cartridge/converter-fill in Sterling Silver Diamond Crosshatch design. GFT. The label on the cap says “Med,” but I would characterize it more medium/broad. “Ball” nib, excellent for right and left handed writers alike. New-old-stock. Mint with original label. Converter included. 1960 Sheaffer Imperial cartridge/converter-fill in Vermeil (Gold-fill over Sterling Silver) Diamond Crosshatch design. GFT. Extra-fine nib. Near mint+. Converter included. 1976 Sheaffer Targa 1007 cartridge/converter-fill in Gold Electroplate “Geometric Classic.” Broad “Ball” nib, good for both left and right handed writers. Near mint+. Converter included. 1976 Sheaffer Targa cartridge/converter-fill in Sterling Silver “Geometric Classic.” Medium nib. Near mint. Will polish on request. Converter included.